At first you might think you’ve fallen asleep watching Boardwalk Empire yet again (which reminds me, Steve Buscemi is really nice when he shows up in your dreams) upon hearing that not only is bootlegging whiskey a living, viable business in modern times, but that there’s a special Moonshine Task Force ins states like Alabama designed to go after anyone making and selling illegal hooch. 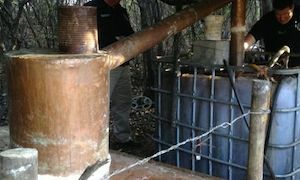 USA Today takes a look at the thriving illegal liquor trade in Alabama, where Woods Whiskey, White Lightning or anything else you can call Moonshine is still very much on the market. A special unit of the Alabama Alcohol Beverage Control Board calls itself the Moonshine Task Force, and it’s trying to stop the flood of black market booze. Unlike in days of yore, it’s not about whether people should be drinking or not, it’s more that it’s illegal revenue that’s going untaxed. And when done incorrectly, it can do serious damage. Because while there are certainly dedicated, discerning liquor folks who have learned their craft as it’s been passed down over generations and “wouldn’t do anything to hurt their customers,” there are also plenty of unfeeling shmucks out there just trying to make a buck. The time to go after those types is now, the task force believes, because eventually the small-timers will move up and into bigger things, which could include arming themselves. Since the four-person task force was formed last October, the group has seized about 500 gallons of moonshine that would sell on the street for about $13,425, along with the ingredients to make another 1,428 gallons. The team has since added three more agents to keep up the bootleg busting. All I know about (legal) moonshine is that if it tastes like blueberries, you’ll want to drink more of it. So be careful.